It's out the door! 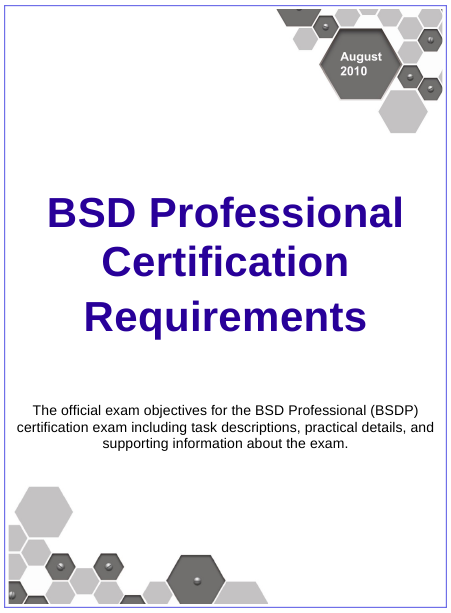 After over 200 hours of work and 15 drafts, the BSD Professional Certification objectives document is now available. Released just in time for your end of summer reading pleasure, the document contains the official exam objectives for 11 knowledge domains, and contains 140 separate objectives. Officially called the "BSD Professional Certification Requirements" the document discusses more than just exam objectives. It describes the methodology used to create the objectives, information on the importance and frequency of each talk and practical details for study. The exam will consist of both a written test and a hands-on lab exam, so the objectives document also identifies which tasks are likely to be present on the lab exam as well. The BSDP exam aims to be the standard of excellence for system administration exams. Achieving a BSDP certification demonstrates that you have what it takes to get the job done from the get go. Read the announcement, and download a copy of the objectives today. Give it a read and let us know what you think on the mailing list. Thanks to all the contributors, reviewers, editors, and our graphic artist for helping to get the document finished.